Cute is the most common description for our mini split tin loaves and they’re one of our most popular breads. There are a lot of low quality accompaniment breads on the market, but we put the same care and attention into our minis as we do the rest of the range. Great things do sometimes come in small packages. Small is beautiful and that’s certainly the case for these little rolls. Made using our great quality ciabatta dough, these are the epitome of both convenience and quality. Perfect for bread baskets or small sandwiches at any occasion. These dipping ciabatta sticks are made to the same recipe as our famous rolls & loaves with a long, slow fermentation for great flavour and texture. Perfect for dipping in oils or as an accompaniment for soups. Approx 2½" diameter, these mini buns are perfect for buffets or canapés (unseeded). A miniature version of our delicious multigrain loaf, perfect with soup, ploughman’s and meal accompaniments. A selection of Mediterranean flavoured breads with mini onion tin loaf, sundried tomato & basil finger, sunflower & honey roll, rosemary focaccia knot dipped in extra virgin rapeseed oil and a three grain seed finger roll. Perfect for dipping, filling or as a meal accompaniment. 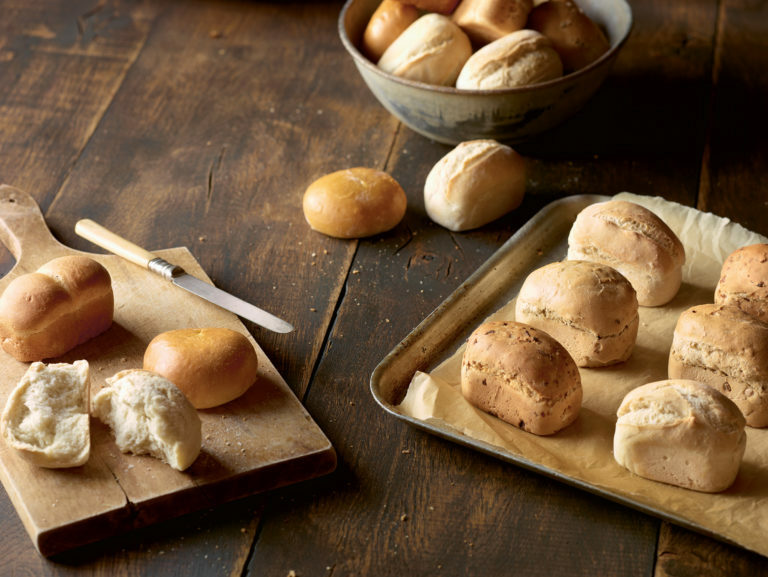 All our dinner roll selections can be given a fantastic crust and an even fresher “freshly baked” flavour and aroma. Just pop the thawed product into a pre-heated oven at 170–200ºC for 1–2 minutes for fresh and crusty rolls. A variety of dinner rolls. The selection includes a mini harveste roll, mini brown roll, mini petit pain, poppy seed Kaiser roll and a mini white tin loaf. Ideal for a dinner accompaniment. A deliciously tasty rich onion mini tin, perfect with soups or as a meal accompaniment. A miniature version of our white tin bread, superb as a breakfast bread or as an accompaniment for soups or ploughman’s.